Tap water is water supplied to a tap. It is used mainly for washing, cooking, drinking and flushing in toilets. Tap water is usually assumed to be portable water or rather drinking water even though water quality problems are not unusual. Tap water is prone to chemical or biological contamination. Many a times the tap water is found contaminated which can be dangerous to public health and so the government advices people to boil water before drinking or to drink bottled water as a substitute. 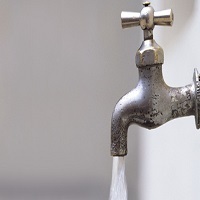 Particular chemical compounds are frequently taken out of tap water through the treatment process to eradicate contaminants and chlorine may also be added to destroy biological pollutants.